Ok, now that I've stopped laughing...and here I was thinking of trying to corner the market on bizzare tea experiments. I bow to you. The only thing I can think of is using it to heat the water. 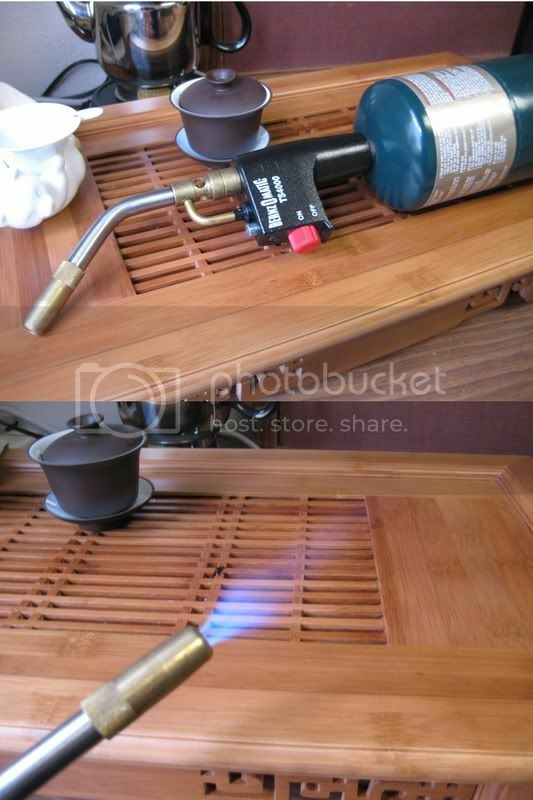 I don't know about the blow torch, but you could paint your tea tray with something cool. Trick it out, yo. Great idea .. Cowboy Cha. Once in while, I use a small alcohol burner to pull additional flavor out of; Pu-erh. You Bad Boy gas torch is a nice touch. Have the leaves be spread out on a pan (cookie sheet type of thing) and then have it be supported by some metal legs -- and then torch the bottom of the pan. Worth a try for your weak aged oolong, eh?